Our featured author for today is a wilderness enthusiast who loves backpacking, skiing and kayaking. He enjoys mysteries, science fiction, action adventure stories and, most especially, novels that explore the relationship between humans and the wild. He lives on an island in the Pacific Northwest with his wife and son, and two hyperactive Australian Shepherds. Kenneth G. Bennett is the author of the young adult novels, THE GAIA WARS and BATTLE FOR CASCADIA, and the new sci-fi thriller, EXODUS 2022. The Page Walker: Foremost, Ken, I'd like to know which writer/s inspire you? TPW: Wow, I spotted 4 favorite authors we have in common. Do you have a favorite spot when writing? KGB: There’s a sunny breakfast nook in my house, where I love to write. It’s close to the coffee. TPW: Coffee, of course. So, when did you decided to become a writer? KGB: By age five or six I was writing stories for my friends. TPW: Your publicist, Vanya Drumschiiska, was kind enough to send me a copy of the cover of your new book. How did you come up with the title? KGB: EXODUS 2022 is about an imminent, cataclysmic “departure” from Planet Earth that humans are completely unaware of, so “EXODUS” fit with the story. Furthermore, while it’s not a religious book it does contain spiritual elements and references to the church. TPW: Who is your favorite character from your book and why? KGB: Ella Tollefson, because of the massive transformation that occurs with her character. TPW: I am always forward when asking this question. Who is your intended audience and why should they read your book? KGB: Thriller, adventure, fantasy and sci-fi readers might enjoy this book because the story is fresh and intriguing and the pace is relentless. TPW: What draws you to this genre? KGB: I am drawn to a lot of different genres and this book reflects that. It’s a mix of sci-fi, fantasy, thriller, wilderness adventure and mystery. TPW: Are there any plans for your next project? KGB: I'm working on a new book called THE HEALER about a man who discovers later in life that he has a unique, one-in-a-billion gift for healing. TPW: Thank you for stopping by, Ken. Godspeed on Exodus 2022. KGB: Yes, thank you for the great questions and for this opportunity! Find Kenneth G. Bennett here. Joe Stanton is in agony. Out of his mind over the death of his young daughter. Or so it seems. Unable to contain his grief, Joe loses control in public, screaming his daughter’s name and causing a huge scene at a hotel on San Juan Island in Washington State. Thing is, Joe Stanton doesn't have a daughter. Never did. And when the authorities arrive they blame the 28-year-old’s outburst on drugs. What they don't yet know is that others up and down the Pacific coast—from the Bering Sea to the Puget Sound—are suffering identical, always fatal mental breakdowns. With the help of his girlfriend—the woman he loves and dreams of marrying—Joe struggles to unravel the meaning of the hallucination destroying his mind. As the couple begins to perceive its significance—and Joe’s role in a looming global calamity—they must also outwit a billionaire weapons contractor bent on exploiting Joe’s newfound understanding of the cosmos, and outlast the time bomb ticking in Joe’s brain. 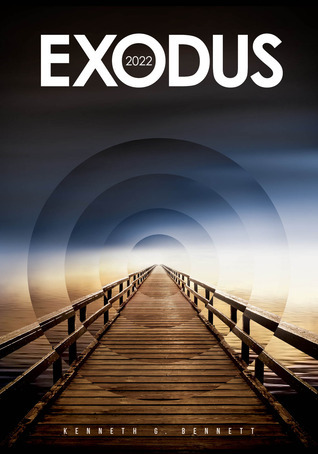 Get your copy of EXODUS 2022 from Amazon.com. *Please read the Review Policy and Disclaimer before leaving a message.